Every year, my brother-in-law’s family descends on my sister’s house the morning after Christmas to consume large amounts of pork, poached eggs, and bread fried in pork fat. Even the mostly vegetarians join in for what’s become known as Porkmas. My sister gets up early and arranges the house so as to fit the whole family in chairs around the living room, and my brother-in-law goes out to the summer kitchen and begins boiling the pork. Everyone arrives at once in a flurry. The younger adults poach the eggs, people drink coffee, fill their plates, talk all at once, and eat with gusto. Then it’s over as fast as it began. Two hours later, the place is cleared out and we don’t know what hit us. Everyone goes his or her separate way, marking the official end of Christmas. This year, I got in my car to drive home, my brother-in-law’s mother went to the casino, and the late-20 and 30-somethings went on a hike. I’m pretty sure my sister took a nap. The recipe has been prepared by the men of the Rogers family for at least 100 years, since the family arrived here from the island of Madeira. Nobody knows how the dish may have changed since its days in the old country. If you look at the stews of Goa, in Southern India, and the escabeches of the Philippines, you might notice that vinegared meats are common in countries that were once colonized by the Portuguese. (Although in the case of escabeche, the word is Arabic, and the culinary influence could have come from Portugal via China). Either way, the Portuguese are big on vinegar. Maybe because it cuts the pork fat? I’ve been told that my brother-in-law Nick’s grandmother drank a cup of vinegar a day for her heart. And yes, she lived a long time. I’m a little late blogging the recipe. But of course you can make pickled pork any time of year, or bookmark this one for next year. It freezes well too. Cut the meat into 1- 2 inch cubes. Put it in a large bowl and add the garlic, bay leaves, chiles, thyme, and salt. Add equal parts cider vinegar and water, to cover. Mix well. 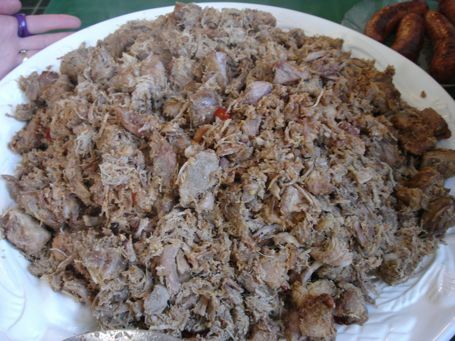 Marinate the pork in a non-reactive food safe container or in heavy-duty plastic zip-lock bags for at least 10 days and up to three weeks. Mix every two days to distribute marinade evenly over the pork. 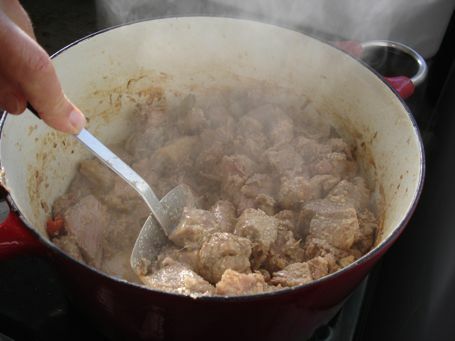 To cook: Put the pork and all of its marinade in a heavy, non-reactive cast-iron or enameled cast-iron Dutch oven or skillet. Turn heat to medium high and bring to a boil. Cook at a vigorous boil until most of the liquid has cooked off, stirring occasionally (about 45 minutes to an hour). Lower heat to medium low and cook, stirring occasionally, until all the liquid is cooked off and the fat begins to render, another 20 minutes or so. 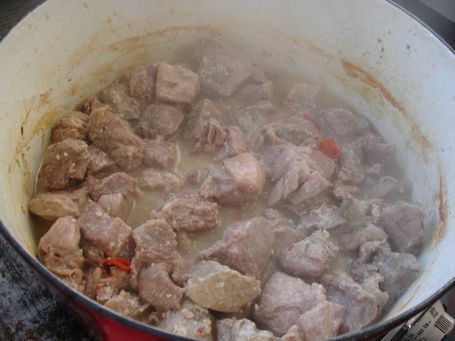 Turn the heat to low and continue to cook until the pork becomes brown and crispy, stirring often. PS: I’m teaching an indoor microfarming class through the Biofuel Oasis with Nishanga Bliss on January 23rd. 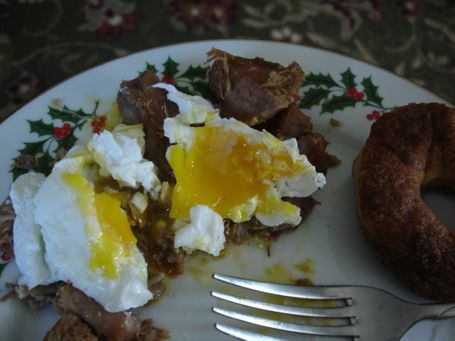 This entry was posted in breakfast, entertaining, hearty, holidays and tagged Christmas breakfast, family recipes, pickled pork, Portuguese pickled pork. Bookmark the permalink. Post a comment or leave a trackback: Trackback URL. My mother’s relatives emigrated from Portugal to Hawaii early 1900s. Everyone has passed away and lost recipe for Christmas “vingadois” or “vingadolis”? This seems very close except you simmer meat, refrigerate, then skim off fat. Fry low and dip bread in juices. Is this the same? Amazing, my family has been using a fairly similar recipe for many years. The pickled pork eaters in our family come from the Portuguese side. Neat to see someone else actually eats the stuff. 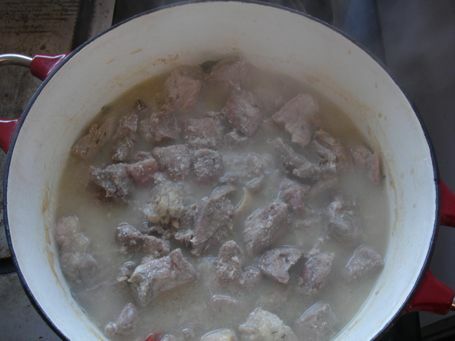 I am cooking up a batch as I write this, I was looking for the Portuguese spelling of the dish.